A few favorite figures from my miniatures collection. A Possessed Chaos Space Marine inspired by the art work in the 3rd ed codex. For those of you who missed this piece – the possess is bursting from his armor with muscles twitching & claws in all directions. 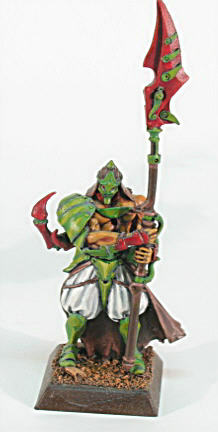 The figure is a Strigoi vampire with a Long Drong pistol and plastic CSM shoulder pads/backpack. A lot of dremmel work was required to fit the shoulder pads & a touch of green stuff built up the backpack mount as well as the leg armor. 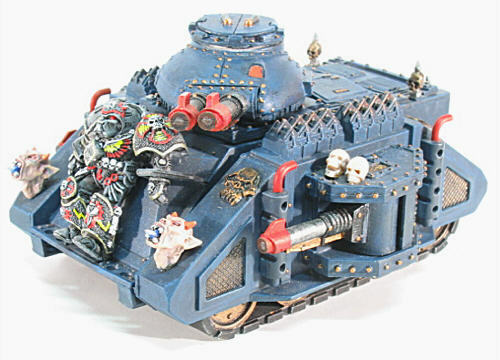 A Chaos Space Marine Predator. This tank dates back to some time in the late nineties & is one of my first major conversions. The Grey Knight welded to the front armor is a never ending source of amusement to me. The rest of the conversion parts include demon prince heads, skeleton shield bosses and BFG launch bays used as engine vents. 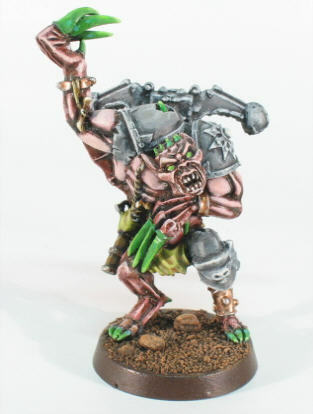 This Confrontation warrior (exact name escapes me) comes from a time when I was hanging out with a few Golden Demon painters and was making a real effort to improve my painting skills. Rackham has a new resin casting division: Fire Industries. The web site is rather basic and without much information beyond the displayed product, but in true Rackham fashion – what they do have listed is worth drooling over. Be sure to check out the Griffon Ruins, this piece has more detail than most figures. I’ll need to keep an eye on this site in the hope that they will not only grow the product line, but add in painting/tutorial information. Story lifted from Tabletop Gaming News. You are currently browsing the archives for the Rackham category.